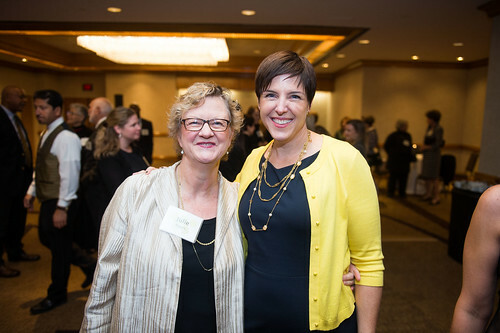 Founded in 1998, Washington Area Womenâ€™s Foundation mobilizes the community to ensure that economically vulnerable women and girls have the resources they need to thrive. It is the only donor-supported, public foundation solely focused on improving the lives of women and girls in the Washington metropolitan region. 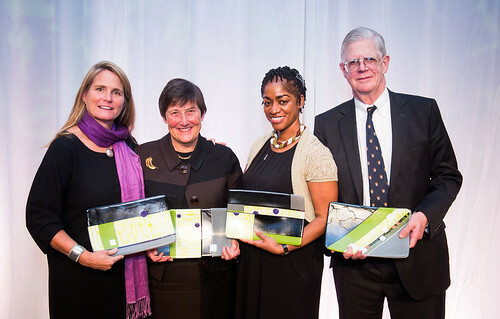 On Wednesday, October 23rd, four Washington-area residents received the first ever Visionary Awards at the Foundationâ€™s annual Leadership Luncheon and 15th anniversary celebration. The recipients were recognized for their exceptional work and dedication to help put women and girls on paths to prosperity. The recipients were: Marion and Rick Ballard, Anne Mosle, and Sharon Williams. 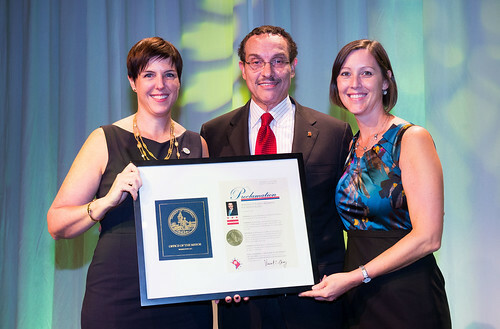 Marion and Rick Ballard of Bethesda, MD were presented with the first Visionary Award by Carolyn Berkowitz, managing vice president of community affairs at Capital One, president of the Capital One Foundation and chair of The Womenâ€™s Foundationâ€™s board of directors. Marion Scattergood Ballard is one of the founders of The Womenâ€™s Foundation, a former chair of the Foundationâ€™s board, and is the longest consecutive donor to the Foundation, having given each year for the past 17 years. She is the founder of Dataplus, Inc. and currently serves on the boards of Planned Parenthood of Metropolitan Washington, Montgomery Women, Nurturing Minds, Inc., and the Levine School of Music. Rick Ballard is a partner at Ballard Spahr, where he practices primarily in federal income tax matters relating to municipal bond issues. He came to the Washington area in 1978 to open the firmâ€™s first office outside Philadelphia. He represents numerous nonprofit organizations on tax-exemption proceedings on a pro bono basis. Together and individually, the Ballards have served as volunteers at the Foundation and fundraisers. They say that their belief that an investment in women is the best investment one can make is what has kept them committed to the Foundation. â€œRick and Marion have demonstrated that with passion, a strong partnership, generosity, a willingness to take on tasks both great and small, and a kindness and humility unlike any other, it is possible to change lives and change the world,â€ said Berkowitz. Anne Mosle is currently a vice president at the Aspen Institute and is the executive director of Ascend, a policy program at the Aspen Institute. She was the longest-serving president of Washington Area Womenâ€™s Foundation, leading the organization from 2000 to 2007. Under her leadership, the Foundation launched the Stepping Stones initiative, which became a model for grantmakers across the country. The Foundation also received its first million dollar gift while Mosle was president. The grant was initiated by Stacey D. Stewart, who was president and CEO of the Fannie Mae Foundation at the time. Stewart presented Mosle with her Visionary Award. Prior to joining the Aspen Institute, Mosle was a vice president and officer at the W.K. Kellogg Foundation. She currently serves on the board of the Tides Network and is on the advisory committee of the Oxford University Said School of Business. Sharon Williams is a nurse at MedStar Southern Maryland Hospital Center. She received her nursing certification at Prince Georgeâ€™s Community College, a Womenâ€™s Foundation Grantee Partner. After struggling with divorce and being a single parent, Williams went to Prince Georgeâ€™s Community College to get the credentials she needed for a job with good wages that would enable her to care for her children. After receiving her certification, she became a nurse and received a scholarship to earn her bachelorâ€™s degree. Next year, she will pursue a masterâ€™s. Williams, a native Washingtonian, continues to return to the neighborhood in which she grew up to encourage her friends and neighbors to pursue higher education, as well. Cecelia Knox, director of the Next Step program at Prince Georgeâ€™s Community College, presented Williams with her Visionary Award. â€¢ Invested approximately $9 million in nonprofits in Montgomery and Prince Georgeâ€™s County, Md., Northern Virginia and Washington, DC. â€¢ Made grants to over 160 community organizations. â€¢ Touched the lives of more than 300,000 women and girls. â€¢ Helped women increase their assets by $35 million. â€¢ Helped over 1,000 women attain new or better-paying jobs. For more information aboutÂ Washington Area Womenâ€™s Foundation please click HERE.